It’s not just the monsoon that’s raining in South India. South India is celebrating the startup shower as well. The peninsula is fast becoming the hot destination for mushrooming of startups. The region has witnessed far many startups emerging than any other region in the country. South Indians are increasingly hopping onto the startup bandwagon and making the most of the situation. The startup frenzy in South India can be attributed to the region being the IT hub of India. The state of the art technology and communication infrastructure, makes the surroundings highly conducive for startup proliferation and stimulating innovation. The externalities of the IT industry, having spillover effects to the startup industry, have helped these new age enterprises propagate and flourish because e-commerce serves as the backbone of these enterprises. Bangalore, popularly known as the Silicon Valley of India, has witnessed a juggernaut of startups in the last few years. Closely following are the cities of Hyderabad, Chennai and Pune. Flipkart, InMobi, Flatchat, InnerChef and Juvalia&you are a few popular startups which laid their foundations in south India. As startups based out of South India are making a mark, startups based out of other regions of India are rapidly setting up their facilities in south India to give competition to their south India counterparts, tap the growing market of customers catered by startups and benefit from the sheer concentration of innovation and technical knowledge fueling startups. Many startups of this region have successfully won over international investors and are receiving funding from foreign venture capitalists and angel investors, echoing of the confidence that the international investor community has on these emerging ventures. South India might boast of the startup pizzazz, but there are certain challenges faced by startups alike. Challenges include the management of operational finance, fund management, working capital management, secretarial compliances, business forecasting and analysis. Further, it is not prudent that the entrepreneurs spend their time and effort in these areas. Rather, it is advisable that they concentrate their talent and skill in core business product development which requires creativity and innovation. At the same time, financial aspects of the business cannot be sidelined, because for any business to survive, healthy financial position is indispensible. Routine financial functions of accounting and payroll management are equally essential, in the light of prudent business practices, not only from the point of view of adhering to regulations but also for internal analysis and control. Maintain an in-house financial team might entail huge costs, which is again a setback for these cash strapped entities. Outsourcing the financial business functions to experts in the domain allows startups to tide over these challenges. 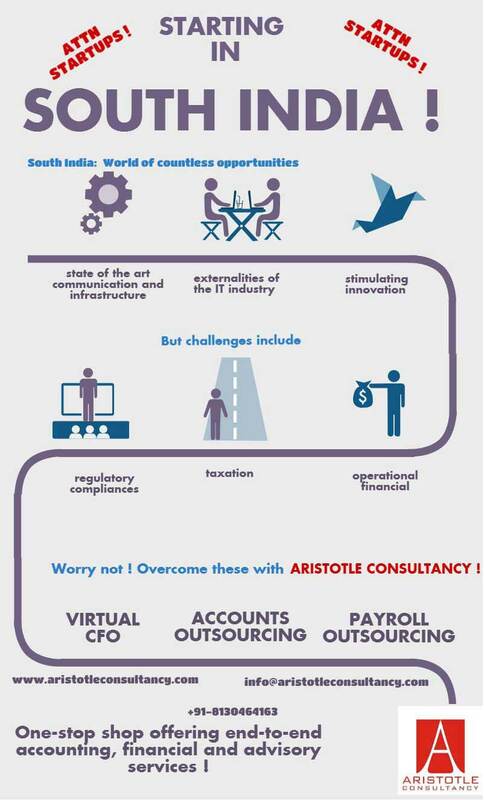 Aristotle Consultancy, operating in Chennai and Bangalore, provides end-to-end finance and accounting solutions to startups and SMEs, to help them progress on the high growth trajectory. With a team of expert and competent individuals, we provide services of virtual CFO, accounting outsourcing, payroll outsourcing and advisory services. Our organization serves as your financial partner through your startup growth journey. We have operations in Delhi as well. Our services are customized according to the needs of individual startups to provide superior financial support and business intelligence. Aristotle Consultancy is the right partner on your road to success.